Final night in Chicago and what a run it's been. 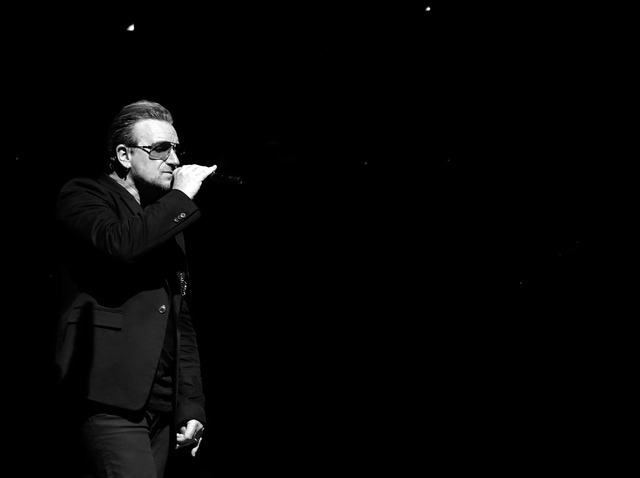 'The end of an 'incredible ten days' as Bono put it, and surrender was again the big idea, the band surrendering to the 'good people of Chicago', the good people to the good music. You'll have other highlights if you were there (add them in the comments below) but here's two we noted - two songs played only sparingly on the tour to date. Gloria was unexpected and breathtaking, only its second performance in ten years. Then, later, this, written thirty years on. California sounded beautiful on the 'e' stage, caught between Mysterious Ways and Ordinary Love, a song Bono introduced like this..
'We’ve been working for him as a band since we were 18 yrs old, i think it was 1978 we did our first anti-apartheid show for Nelson Mandela, he was like our boss, got us into debt cancellation and lots of other stuff. this is an aside, but it was the Arch’s wedding anniversary yesterday with Leah his missus, 60th wedding anniversary.. that's pretty cool. What are the odds of these two men coming from the same neighborhood. that's pretty incredible. Sounded like a winner tonight, but then the whole night sounded like a winner, these five shows. Thank you Chicago..
All the way down to the final song, an ancient song, the one we all left the building singing. Were you at the final night in Chicago? What were your highlights? Post your own review and add your photos below.. So glad I got to see this show with someone who means the world to me. We drove up from St Louis and had a great time! 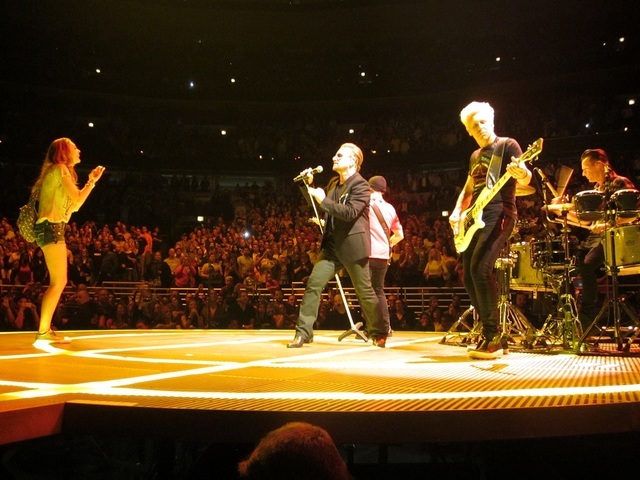 I´m from Colombia, I traveled to Chicago Only to see U2, and God gave me the best location!! My sister and I were in first line at the catwalk, dreams come true. thanx God and thanx U2 for the best concert ever. Well worth the long flight and drive!! This was my third show this week and most enjoyed because all three of my babies (Kyle, Grace and Max) accompanied me. They know their mother is nuts over the band and so are they. Really enojyed Gloria and 40! 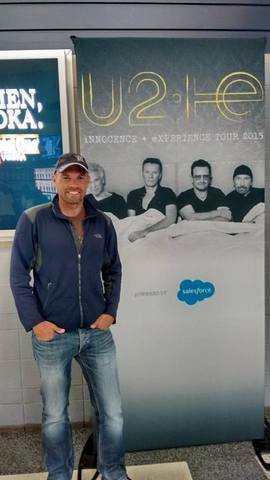 My first U2 concert, won't be the last! My first U2 (July 3) concert and it was all that I had ever heard about one - amazing! Been a fan since the early 90s and I loved every moment of it. Bono's voice is incredibly strong and versatile, and the rest of the band, Adam, Edge, Larry were solid as well. My sister and I had a great time! Love you guys! A Sketch for Henry By BONO! Bono was kind enough to do a sketch for Henry in the Rollingstone U2 featured Magazine! 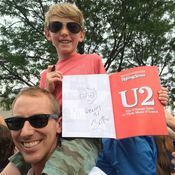 Was Henry's first U2 concert. GA for nights 3 & 4! Amazing night, for an amazing tour in Chicago! I got to eXPERIENCE the tour from 2 different vantage point, from the level 300, where I got to see the LED screen story telling, and the up-close and personal experience from the rail. My photo summarize the feel and experience of a wonderful night. I can't wait to see them again live and create more memories from their songs being brought to life in a live performance. What a show! 24 songs, all just incredibly performed... You can't ask for a better show. Bono was on fire and seemed to be completely over that nasty case of bronchitis he was fighting during the first show. I have seen U2 in concert multiple times each tour since the Elevation Tour back in 2001, but I personally feel this was one of their best shows I've ever seen. 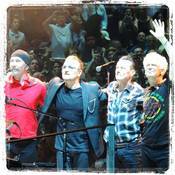 U2 has a knack for storytelling and make their concerts about so much more than just performing their songs for an audience. It was exhilarating, inspiring, and uplifting. It didn't hurt that all four band members were out signing autographs before the show. What a special night for everyone. Unbelievable show! They just seem to get better with time! Worth the drive from Ohio to Chicago! Hope they stop in Ohio next time around! 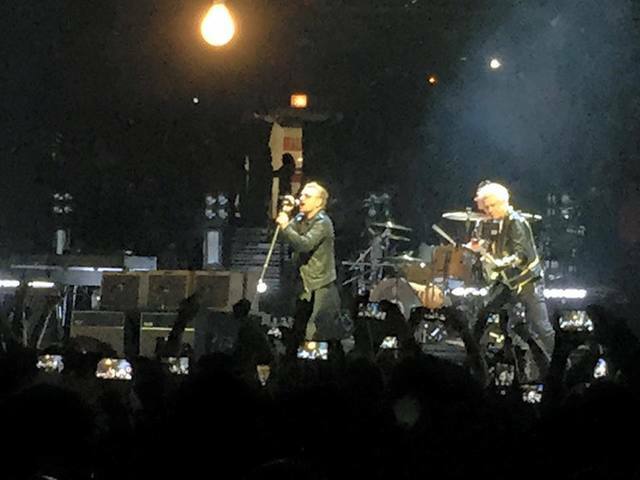 Incredible Final Chicago U2 show!! I flew all the way from Texas to catch the final Chicago show….we scored GA tickets last year and had an awesome time during the show! Got some incredible pics! Going to see them again in Berlin!!! Love U2!!! The boys from Ireland did not disappoint. My 1st U2 show was in 1981...I was 15, love at 1st sound. Many shows later, took my wife of 24 yrs to #5 in Chicago...WOW! Please come back next year!!! Saw 3 of the 5 Chicago shows. Incredible!!! The last show was my favorite. They played Gloria which was simply amazing!! It should be a regular in the set list. So glad I heard Bad and 40 at the last show as well. California was cool live and Every Breaking Wave is a very powerful ballad. The Miracle is better live then on the album. In fact, I think most of the new songs sounded better live. 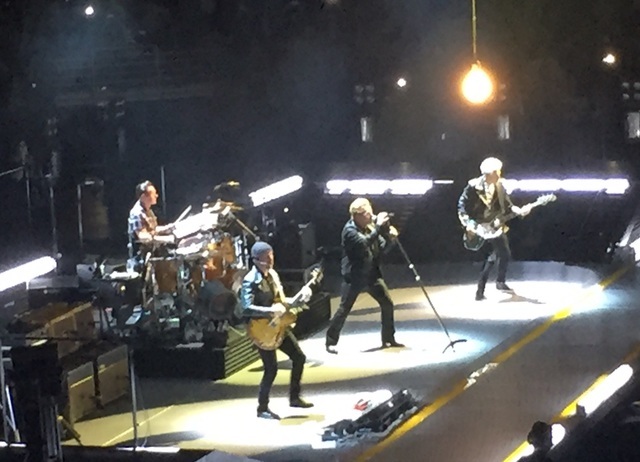 Have now seen U2 9 times and July 2nd was the best concert I've seen. Went to two shows! Loved the stage and screen. You do still have a lot to say & we want to hear it. 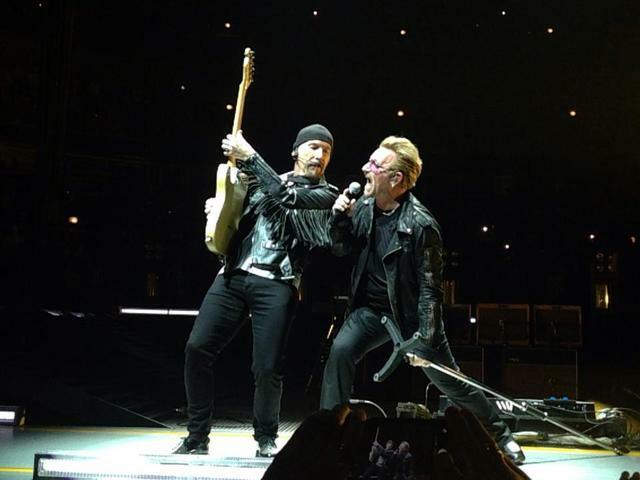 U2 you have a home in Chicago always! Thank you for what you do and come back soon! "Exit" was good medicine for me. Once upon a time, I cranked up Exit so loud, the office next to my therapist complained, and he worked it out with them. Suffice it to say, contradicting Bono's claim, your music can be good medicine, as it was for me at a key positive inflection point in my life. Please play "40" to close out the night! Seems like the perfect way to wrap up an amazing run in Chicago! Had to see it a 2nd time! At the United Center with hubby Sunday Night (his Christmas present to me! XOXO). Had to come back again. Bringing my daughter to the final Chicago show. I know it's asking alot, but would melt if you played Where The Streets Have No Name, Still Haven't Found What I'm Looking For, In God's Country. All my babies were raised with Joshua Tree! Love you and your art! please play "Acrobat" :) thank you! Go out with a Bang in Chicago! 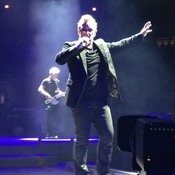 It has been a tremendous week having U2 in Chicago! All 4 nights have been incredible and looking for to the 5th and sadly final show in Chicago. Here is my ideal setlist (but at this point I am happy with anything U2 plays). This will be my 20th show overall seeing them...it never gets old! Here is what I am thinking...and would send the boys out like a bang and on a high heading to Toronto. Here is my hope...: SET 1-- 01. The Miracle 02. Two Hearts Beat As One (one of my favorites on War; never heard it live & would love to) 03. Vertigo 04. I Will Follow 05. Iris 06. Cedarwood Road 07. Song For Someone 08. Sunday Bloody Sunday 09. Raised By Wolves 10. Until the End of World SET 2-- 11. Invisible 12. Mysterious Ways 13. Even Better Than The Real Thing 14. California (not yet played in Chicago...and a gem on the new album) 15. When Love Comes To Town (Chicago is a Blues Town...so bring on the Blues) 16. Every Breaking Wave 17. Bullet the Blue Sky 18. Pride 19. Beautiful Day 20. The Troubles (not yet played in Chicago...and another gem on the new album) 21. With or Without Encore-- 22. City of Blinding Lights 23. Where the Street Have No Name 24. One Tree Hill (for Greg Carroll who passed away 19 years ago). 25. 40 * I know this is a wishful setlist, but would be amazing...we will see come Thursday! thank you for the past 30 years!!! I haven't seen U2 since Popmart/Lemon at Camp Randall in Madison...cannot express enough how excited for night 5! Bringing my special needs niece to her first concert...please check on us back in section 118!! 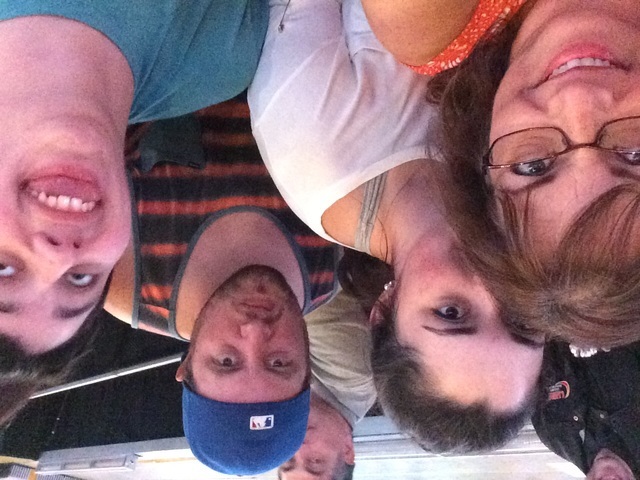 Seeing the show 7/2. Can't wait! Last time in Chicago for 360 tour Snow Patrol opened up. Who is opening this time around? 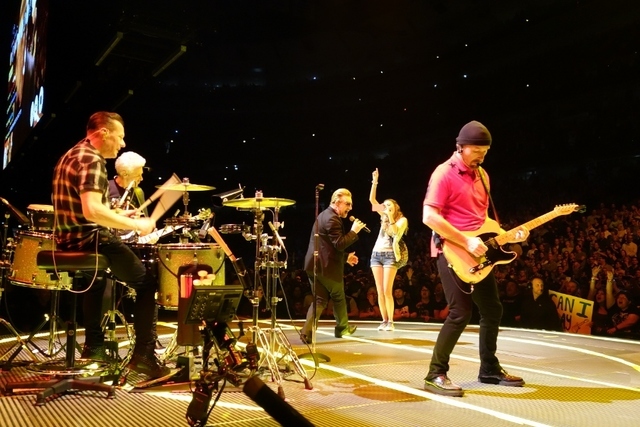 I've seen U2 many times, the first was when THEY opened for J. Geils in 1981! Love at first sound! On the way in 5 days! Even if U2 doesn't play One Tree Hill, please keep Greg Carroll in your thoughts on the anniversary of the day he left us ... 03-Jul-1986. If U2 does perform this rare song (last played in Chicago on the 360 Tour), it will definitely be emotional. I would really like listening "Bad" and "Miracle Drug" as in the first shows of the tour. This will be my third time at a U2 concert (1st Popmart, 2nd Vertigo) and the first one for my wife. We´re coming from Guatemala City, hope it´ll be a memorable night!!! I would really like listening "Bad" and "Miracle Drug" as in the first shows of the tour. This will be my third time at a U2 concert (1st Popmart, 2nd Vertigo) and the first for my wife. We´re coming from Guatemala City to Chicago to see you guys, hope it would be a memorable night!! This will be my second time to see you guys on my birthday; I got to see you in Nashville on the 360 tour. This will be my eleventh time to see you guys in concert and am as excited to see you this time as the very first. Hoping you'll come back to Atlanta on the second American leg. Any chance of hearing "All I Want Is You" would be greatly appreciated. 2 July is my birthday so I treated myself and my sister to top-price tickets. Her birthday is 29 June. We'll be in Sec. 103 if you want to sing "Happy Birthday" to us. She will be seeing U2 for the first time, so I know she'll be blown away.